Chief Malloy was born in Berlin, New Hampshire on February 27, 1895. 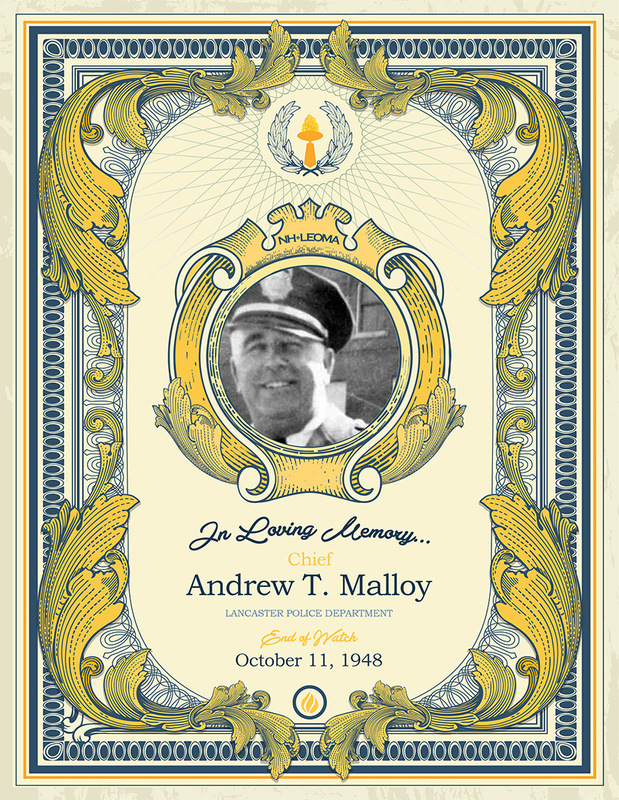 While a resident of Berlin, Chief Malloy served on the City Council, was a boxing promoter, and was active in the Boy Scouts and the Red Cross. Prior to being appointed Chief of Lancaster Police Department in 1946, he had been a member of the Berlin Police Department for eleven years. On October 11, 1948, after returning from a court hearing in Groveton, the cruiser that Chief Malloy was riding in collided with the side of a Boston and Maine freight train at a crossing. Chief Malloy, along with Trooper Harold B. Johnson, died instantly. The driver of the cruiser, Trooper Frank Helms, suffered a concussion and other injuries but survived the crash. Chief Malloy is survived by his wife, Helen, and four children; Robert, Thomas, Eleanor and Miriam.